Short Term Trading forex trading links forex trading books market statistics trader values euro and us dollar Shocks Crashing USD/JPY: Is The Decline of the Japanese Yen Over? 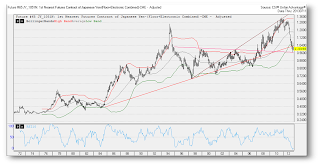 USD/JPY: Is The Decline of the Japanese Yen Over? The decline of the yen might be close to an end, according to past trend history. The hypothetical recovery will take time, since yen fundamentals remain weak. On July 11, 2013, the Bank of Japan (BOJ) left its monetary policy unchanged. The bank was more optimistic about economic growth in Japan, as the housing recovery has become tangible and business investment has stopped weakening. GDP is expected to grow from 2.5-3%, up from 2.4-3% expected in April. In reality, the bank’s objective of battling deflation has not been too successful thus far. As a result, it will continue its current monetary policy until inflation reaches 2.0 percent. The bank will increase the monetary mass at an annual pace of 60 trillion to 70 trillion Japanese yen. With no new political elections until 2016, the Abe administration will be able to complete its political agenda. The Abe reforms should include agriculture, health care, and investments. The yen should be kept low for as long as possible, to further stimulate exports and revitalize the economy. Nonetheless, the currency appears to be approaching an important bottom on the futures charts. Let us see why. This year, the USD/JPY temporarily declined to 0.9600 before returning to above 1.00 (futures prices). It lost almost 30 percent from its highs. Despite current weakness, the yen appears not to have completed the long-term bull cycles that started in 2007, and it could try to bottom out at current levels. In previous bull trends, the USD/JPY rose 40 to 50 percent (four to five years) from its lows (40-85 and 63-126) before topping, then corrected for 25 to 30 percent (two to three years) from the highs (84-62). The full cycle (five waves from 1984 to 1995) expanded 65 to 75 percent (40-126) and lasted for eight to 10 years before turning down. The bear cycles continued instead for 44 percent (126-70) and 38 percent (56-35). They trended for seven to 11 years before bottoming out (1978–1985 and 1995–2007). How does this fit in the current scenario? 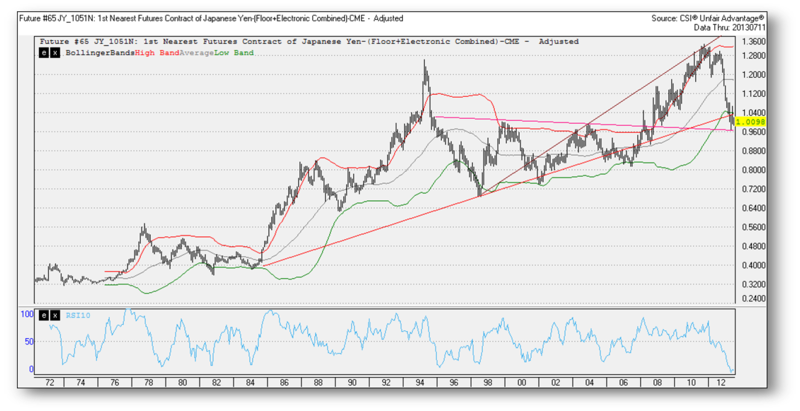 The USD/JPY bottomed out in 2007 at 82 and rose until 2011 (four years) at 132 (39 percent). As a result, the current decline of 30 percent, which has been ongoing for about two years, could represent a crucial level for the yen. The currency is bouncing on two long-term support lines at around 0.9600. A tentative bottom is possible. However, the next level to watch is 0.9000 on the monthly futures contract.